We’ve seen beer brewed from everything from facial hair to bull testicles. Now you can add half-digested coffee beans picked out of elephants’ dung to the list. 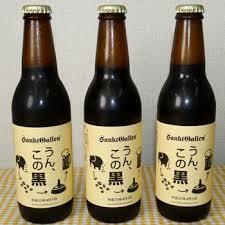 Recently Japanese brewery Sankt Gallen introduced Un, Kono Kuro, a brew made from coffee beans that have passed through an elephant (there is no actual poop in the beer)–a technique that breaks down proteins in the coffee bean, giving the beer a smooth, earthy flavor. According to RocketNews24, Sankt Gallen sold out of the brew on the first day of its sale, which was on April Fools’ Day (no joke). So how did it taste? Apparently, pretty good, according to RocketNews24.